Rubber bumper that fits on top of the hood adjustment screw. Includes 2 bumpers. Reproduction die cut gasket to replace your dry cracked heater core gasket. Reproduction battery tray clamp. Manufactured in steel as original. Mounting screw included. Reproduction of the radiator overflow cap used on al 1974-77 Camaro models and the 1980 Camaro models with 4.9L engines. Cap includes the words "ENGINE COOLANT ONLY". Rubber radiator retainer mounting pad for small block. 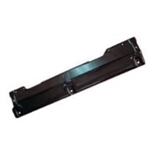 Firewall wire gutter with correct exterior finish and slotted mounting holes. Includes correct size, plated mounting screws. 1970-71 Camaro models with big block. Correct reproduction rear hood adjustment that keeps the proper clearance of the hood from windshield. 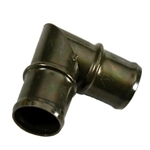 Elbow that inserts into the RH passenger side valve cover and completes the connection to the air cleaner hose. For 1967-70 Big Block with 1"i.d. x 3 1/2" L w/90° bend. Reproduction of the original battery tray for use on all 1970-81 Camaro models. Stamped steel reproduction in EDP primer. Four correct gauge and hole size metal plates to repair rusted, enlarged hole or thin tops of the four sub-frame to body mounting brackets. Welding required. Will work for all 1967-74 Camaro / Firebird models and all 1968-74 Nova models. Correct reproduction rear center hood adjustment kit. Used on all equipped with hidden wipers.. Adjuster kit keeps proper clearance for wipers to retract below hood. Correct reproduction replacement for all 1967-72 Camaro models with small block engines except 1969 302 and 350 engines. Reproduction battery tray and clamp with screw. Replace your original rusted damaged sub-frame and radiator hardware with this quality reproduction kit. This kit contains all the bolts, washers and nuts to complete the job. 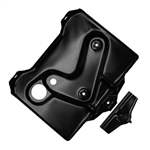 Replace your heater box seals with precision die-cut neoprene seals that restore original heating and sealing efficiency. Each complete kit includes core to box seal, main duct flap door, intermediate plenum flap door, and core outlet tube seals. All seals are die cut for exact replacement. Note: Not for use on vehicles equipped with AC. Fits all small block and big block heater boxes. Replace your original radiator support bushings with this quality reproduction kit. This kit contains bushings only. This kit is not technically correct for 1973-81 Camaro's but will work. Bushings used for frame brackets to vertical mounting support on radiator support. Replace your original radiator support bushings and hardware with this quality reproduction kit. This kit contains all the bushings, bolts, washers and nuts to complete the job. This kit is not correct for 1973-81 Camaros but will work. 1970-81 Camaro Radiator Top Plate. 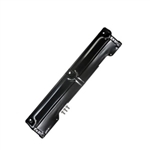 Black radiator top support metal cover panel for 70 - 81 Camaro models with A/C that require a heavy duty radiator. Measures 28 11/16 x 5 1/2 in. with 3 bolt holes. This is for a Camaro with a heavy duty 26 in wide radiator core. 1970-81 Camaro Radiator Top Plate. Black radiator top support metal cover panel for 70 - 81 Camaro models without A/C. Reproduction of the original 1973-77 Camaro radiator overflow bottle used on all Camaro models. Reproduction sub-frame bushing mounting kit that is design to replace your worn factory originals. Kit includes the sub-frame bushings with steel sleeves. Reproduction of the vented radiator overflow jar for all 1978-79 Camaro models. This plastic bottle is manufactured with correct HOT/COLD lines as original and includes mounting screws. Does not include the required non-vented "Engine Coolant Cap" part # 371978. Correct for 1978-79 Camaros but will work on 1980-81 Camaros. The 80-81 original cap will not work on this jug. This is a quality rubber reproduction bushing mounting kit that is design to replace your worn factory originals. Kit includes the subframe and radiator support bushings with steel sleeves. Reproduction heater box use on cars without air conditioning. A complete kit of subframe mounting plates will take care of the rotted out crucial areas where the subframe bushings mount. After years of abuse, the plates may become damaged beyond repair. You certainly don't want to replace the bushings without checking the plates. These new plates will secure the subframe and add stability to the original frame. Includes the rear subframe plates, middle frame plates and the core support plates. 1967-74 Camaro / Firebird models and all 1968-74 Nova models.